After a few drinks, you feel dizzy and want to lie down. Ok. Lying down with a big bottle shaped armpillow will make your sleep more comfortable. 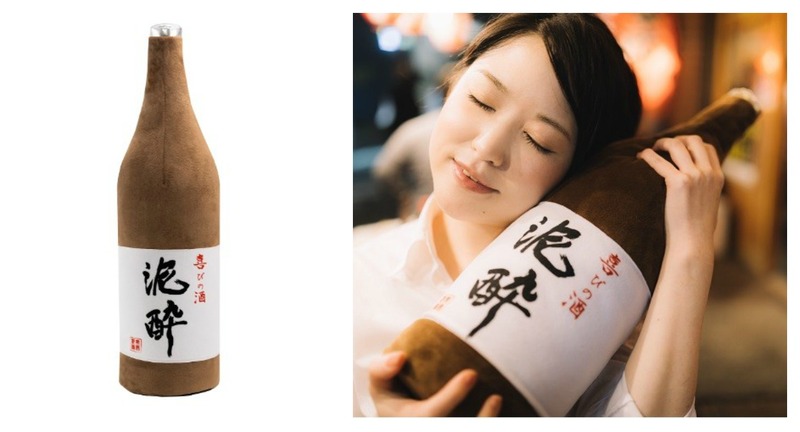 The “1 litre bottle armpillow” is modeled after the actual 1.8 litre “ishobin” sake bottles, which are typically reserved by parties or celebratory gatherings in Japan. The Kanji on label of the armpillow reads “泥酔”, which means “dead drunk” in English. It seems to be a fun gift for someone who loves alcohol. This item was once available at Village Vanguard’s online store for 2,700yen, but all are sold out now. Nevertheless, you can place your order at Village Vanguard, and will be notified when the item is restocked. Food and wine are great companions. When you are cuddling a bottle shaped armpillow in your left arm, how about your right arm? It can’t be left empty. A “sushi” pillow should be in place to guarantee a better sleep. Various designs of cute sushi pillows are available at amazon. Don’t forget to pamper your neck when you are hugging two pillows in your arms. Wrap your neck with a shrimp shaped neck pillow to get good support for your head. The comfort coming from three pillows around you will wrap you in a beautiful dream of delicious Japanese food and beverage. The giant shrimp shaped neck pillow is also available at amazon shrimp neck pillow.